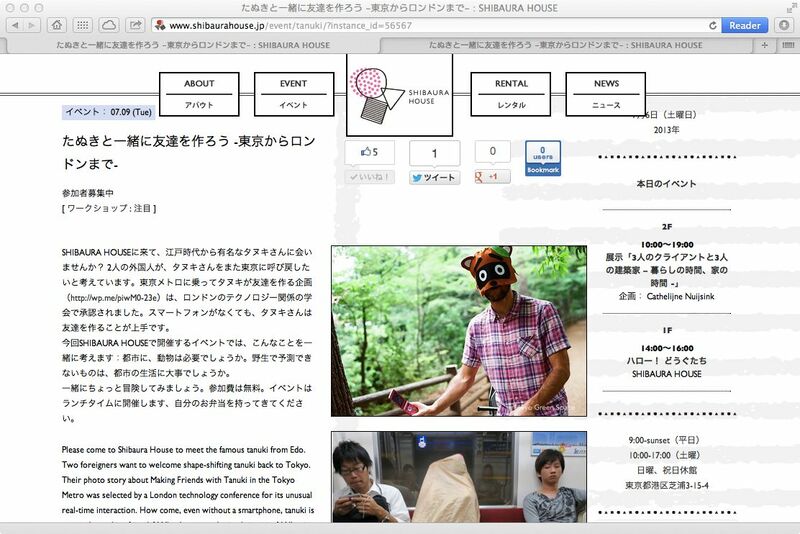 Please join @a_small_lab and me for a tanuki adventure next Tuesday, July 9, noon to 1 pm, at Shibaura House. Details below. Many thanks to Shibaura House for their support. Please come to Shibaura House to meet the famous tanuki from Edo. Two foreigners want to welcome shape-shifting tanuki back to Tokyo. Their photo story about Making Friends with Tanuki in the Tokyo Metro was selected by a London technology conference for its unusual real-time interaction. How come, even without a smartphone, tanuki is so good at making friends? Why do we need animals in cities? What is the importance of wild and unexpected things in our lives? Please bring an open mind and your own bento. Let’s go on an adventure. It’s lovely to see these flowers outside a small neighborhood restaurant. The set-up could not be simpler: easily re-blooming perennials. a liquor crate, recycled wood. A simple gesture communicates to the street and offers a chance for interaction with pedestrians. Readers, I know the orange flower is clivia. What is the smaller salmon colored flower? I have grown both in San Francisco. Update: Thanks to Jason Dewees, the salmon colored flower has been identified as Freesia (Lapeirousia) laxa.